The guitar is most commonly tuned to standard tuning. Starting from the lowest (thickest) string and continuing to the highest (thinnest) string, standard tuning pitches are E–A–D–G–B–E. To begin tuning your guitar using your own electronic tuner, skip ahead to the next paragraph. To tune your guitar using our interactive tuner, you’ll first need to make sure your computer’s built-in microphone is turned on. If you can’t access your computer’s built-in mic, you can use our alternative tuner, which provides tuning pitches for up to 10 preset tunings. Go to our Tuning by Ear section to begin. First, play the lowest (thickest) string. The tuner will tell you what note it thinks you’re trying to tune. Make sure it matches the note to which you’re trying to tune; for example, if you’re tuning to standard tuning, it should say “E.” The meter should then show you whether that note is sharp (too high in pitch) or flat (too low in pitch). Adjust the pitch of the string using the tuning keys on the headstock of your guitar. If the note is sharp, loosen the string to lower the pitch. If the note is flat, tighten the string to raise the pitch. Once the meter is right in the middle, the string is in tune. Repeat this process for each string until you’re all tuned up. If you can’t turn on your computer’s built-in microphone, you can tune your guitar by ear using the pitches provided in our tuner above. First, choose your tuning (e.g., Standard, Drop-D, etc. ), and then click on the lowest string pictured. While the note rings out, pluck the corresponding string on your guitar and adjust the tuning peg until the pitches match. *TIP: If the two pitches don’t match, you’ll hear “beats” while the two pitches ring together. The further out of tune they are, the faster the beats sound. The closer to being in tune they are, the slower the beats will sound. When the two pitches match, the “beats” will disappear, indicating the string has been properly tuned. Similar to using our passive tuner, you can also use a piano or electric keyboard to tune your guitar. 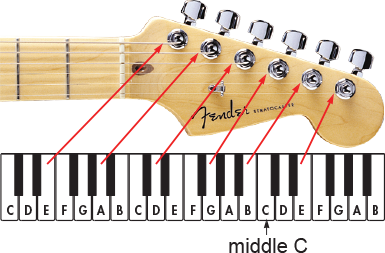 Here is an illustration of a piano keyboard with each of the guitar’s six string pitches indicated. Sit at the piano with your guitar in hand. Depress the “sustain” pedal on the piano and then press the piano key that corresponds to the guitar string you wish to tune. While the piano note is ringing, strike the corresponding open string on your guitar and adjust its tuning until the pitch matches that of the piano. If you don’t have access to a tuner or a piano, you can also tune by ear, essentially tuning the guitar to itself. This is called relative tuning. It takes a bit of practice, so be patient and listen very carefully as you match the pitches. Here are a couple of ways you can tune your guitar by ear. Press down at the 5th fret on your low E string. This produces the note A, to which you’ll tune the open 5th string. Play the fretted 6th string and then open 5th string and let them ring. While the pitches are ringing, adjust the tuning of the 5th string until the two pitches match. When they match, you’re in tune. Press down the 5th string at the 5th fret to sound a D note, to which you’ll tune the open 4th string. Play the fretted 5th string and the open 4th string, adjusting the 4th string until the pitches match. Press down the 4th string at the 5th fret to sound a G note, to which you’ll tune the open 3rd string. Play the fretted 4th string and the open 3rd string, adjusting the 3rd string until the pitches match. Now you’ll need to change it up a bit. To tune the 2nd string, you need to first press down the 3rd string at the 4th fret (rathe than the 5th) to sound a B note, to which you’ll tune the open 2nd string. Play the fretted 3rd string and the open 2nd string, adjusting the 2nd string until the pitches match. To tune the high E string, you’ll return to the 5th fret of the 2nd string, thus sounding an E note. Play the open 1st string against the fretted 2nd string, adjusting the pitch of the 1st string until the pitches match. Once you’ve completed the above steps, your guitar will be in relative tune. It’s a good idea to repeat the process right away, as some of the lower strings may go slightly out of tune as you adjust the higher strings—especially if any were way out of tune. * Tip: Although you may not have a resource pitch like a piano or tuning fork, if you know of a song that uses a standard-tuned open E note, like Heart’s “Barracuda,” you can tune your low E string to that recording, and then commence the 5th-fret tuning method, for a more accurate tuning.